Electric vehicles are not new, in the early 1900’s, Ferdinand Porsche produced the world’s first electrically driven vehicle and also the world’s first hybrid too. But petrol and then diesel powered vehicles caught on and electric vehicles slipped into the background other than the iconic milk float. It was only at the opposite end of the century, with greenhouse gas emissions increasing rapidly, that the electric vehicle has resurfaced as a serious contender in the market. But what are we, commercial electricians, doing talking about the history of the motor industry? Simple, as electricians, we have always regarded ourselves as being environmentally friendly. We recycle as much as possible down at the tip, minimise our use of paper in the office, buying energy efficient appliances, fitting energy efficient lighting and so on. We even try to get our clients to use energy efficient LED lighting too! And now we have ordered a new van and take delivery of it in March. An electric one, the Nissan e NV200 to be precise. It’s a bit faster than a milk float so our already fast call out times will not be compromised! Various things, apart from its green credentials, drew us to this particular model. The interior of the cab is excellent, we often need to fill in paperwork out on the road between jobs and the cab will make a great little mobile office. It is well laid out and feels like driving a car rather than a van. It has a great carrying capacity with a well thought out cargo space, perfect for all the gear and parts we need to carry with us. Quite often, commercial and hotel electrics malfunction in the night. We are always a bit concious of the noise our diesel vans made in the small hours, especially if your unit is close to a residential area. The new van is extremely quiet so your neighbours or your hotel guests can continue to sleep as we work to solve your electrical problem. It is well specced, with rear view parking cameras, a slick gear change mechanism, an amazingly tight turning circle and a range of over 100 miles which is perfect for our central London jobs although we might struggle a bit to get to any Scottish jobs!! Recharging is a breeze, it was quite amusing when the garage offered to send in an electrician to install the charging point. The salesman was a little red-faced as we explained that we might not need their help! 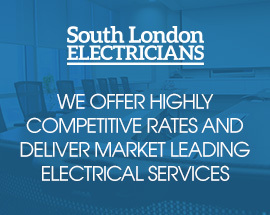 So why not go green yourself, call South London Electricians on 020 3199 8248 to find out how our commercial electrical service can help you at any time of day or night.